EAST RUTHERFORD, N.J. (AP) — They were long-time teammates and champions on the New York Giants‘ Super Bowl team in February 2012. Eli Manning and Jason Pierre-Paul will add a new dimension to their eight-year friendship Sunday when the Giants (2-7) host the Tampa Bay Buccaneers (3-6) at MetLife Stadium. They’ll be opponents for the first time. As he has been the past 15 seasons, Manning will be quarterback for the Giants. 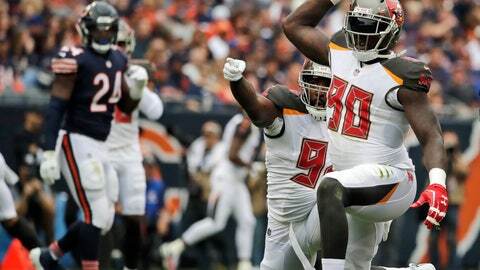 Pierre-Paul will be playing defensive end for Tampa Bay in his first game at the Meadowlands since New York traded him to the Bucs in March to clear salary-cap space. Pierre-Paul has had this date checked since the schedule was announced. Pierre-Paul didn’t get the best sendoff after the trade. Not many teammates called him, although Manning did. Manning laughed saying, he hopes JPP takes it easy on him. The Giants’ offensive line, which added waiver-wire pickup Jamon Brown at right guard, had one of its better performances Monday. Manning, who has been sacked 32 times, was taken down once. Left tackle Nate Solder will probably go against Pierre-Paul most of the time. Since Pierre-Paul lines up at different spots, right tackle Chad Wheeler also will go against him. Expect a tight end or a running back to chip him. Tampa Bay has the NFL’s top-ranked passing attack and is also No. 1 in total offense. With 3,251 yards passing, the Bucs have thrown for the second-most yards through the first nine games of a season in NFL history behind the 2000 St. Louis Rams (3,330). They’ve had over 500 yards total offense four times this season, but are 1-3 in those games, including last week’s loss to Washington. Turnovers are the biggest reason. They are a league-worst minus-19 and have gone six consecutive games without a takeaway. Tampa Bay’s Mike Evans and New York’s Odell Beckham Jr. were part of an outstanding class of rookie receivers who entered the NFL in 2014. The group included Brandin Cooks, Jarvis Landry, Devante Adams, Sammy Watkins, Allen Robinson, Jordan Matthews, John Brown and Kelvin Benjamin. Evans (5,416) and Beckham (5,282) rank 1-2 among the class in career yards receiving, while Beckham is first with 42 TD catches, followed by Evans with 36. Beckham has 24 100-yard receiving games, tops in the class. Evans is next at 17. The Giants have 10 sacks. Rookies Lorenzo Carter and B.J. Hill lead with two apiece. The Bucs had allowed 26 sacks, but they also throw the ball an average of 41 times. The Giants seemingly have found someone to return kickoffs. Corey Coleman handled the job for the first time in his NFL career, averaging almost 31 yards on three returns. Special teams coordinator Thomas McGaughey was confident the 15th overall pick in the 2016 draft (Cleveland) could handle the job after being signed to the practice squad on Oct. 18. He had been waived by the Patriots.